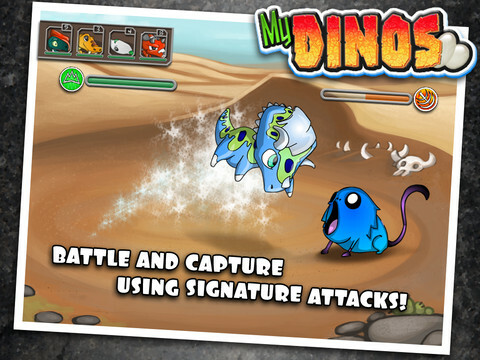 MyDinos is the newest example of a hybrid game. Available for free, Oceanside Interactive's iPhone and iPad title is equal parts Pokemon and Jurassic Park Builder. 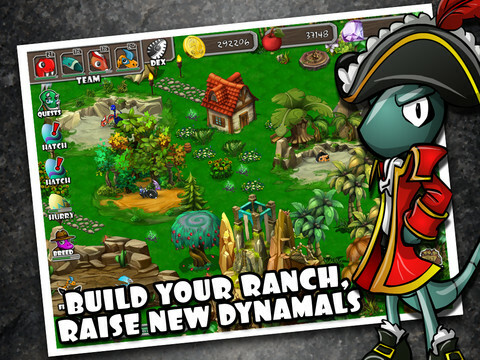 The former lets you capture over 500 creatures known as Dynamals, level them up and then battle rivals, whereas the latter gives you the opportunity to customize a ranch with the goal of clearing land to create habitats for your new pets. Ultimately, it does nothing we haven't see before, but who cares? MyDinos packs just enough enjoyment to warrant a look. Pokemon fanatics will instantly recognize the battle system and overall structure to capturing Dynamals. Each battle monster belongs to one of 18 unique elemental types, and by now, you should know what comes next. Some elements dominate others, so the goal here (one of several, really) is to create a balanced team of Dynamals and gain enough XP over time to level them up, whereupon which you can tackle more difficult opposition. You can also battle friends and random enemies' Dynamals, but this isn't head-to-head multiplayer, and the game just awards XP and a modest amount of coins for your victory. What's especially cool is the ability to breed Dynamals to create more powerful types. This drives our personal goal to acquire as many critters as possible, since the process is slightly more complex than just mashing animals together. Not only must Dynamals be of a certain level, but also a specific match. Then, we have the building element. This is where you're able to purchase a variety of things to add a personal touch to your ranch. The list ranges from Bug, Cloud and Swamp habitats for Dynamals, to food trees, flags and cottages. You'll even receive a huge assortment of quests to complete, where the game tasks you with visiting a specific environment or capturing a certain Dynamal. All of this works quite well. The biggest issues involve the sheer amount of things to do, which may intimidate some players, and our personal opinion that, while MyDinos offers several hours of fun, there's nothing particularly groundbreaking about it. Yes, it clones Pokemon and world building titles, but that's all it does. At the end of the day, though, this isn't necessarily a deal breaker. MyDinos fails to innovate, but if you love the concept of training monsters and decorating a virtual space, this freemium game checks the right boxes. What's Hot: Over 500 Dynamals, breeding creatures to make new ones, customizing one's ranch, visiting other players and battling their Dynamals for rewards, plenty of quests to complete. What's Not: No in-depth tutorial, borrows heavily from other games, no head-to-head multiplayer.